We extend our warmest regards to you all. 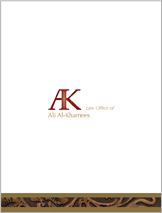 Our office aims at developing the humane and noble legal profession. We strongly believe in the tasks and responsibilities of the role of the legal profession towards society. It is an active and genuine profession that guides the judicial institutions in working for the superiority of right and the indoctrination of the concept of justice among the people.